I'm a sucker for holidays. Any holiday. Especially since having my daughter. Christmas, Fourth of July, St. Patricks Day, Groundhog Day, Arbor Day... well, maybe not Arbor Day. It's such a fun excuse to get crafty and decorate the house. Valentine's Day is a particular favorite. This year is breaking my heart a little bit. We are only allowed to bring 5 Valentine's that are not addressed or in an envelope. So, we went the silly straw route. It's always nice to have a non-candy option that still actually interests the kids. I bought these silly straws from Amazon and went to work making a printable. 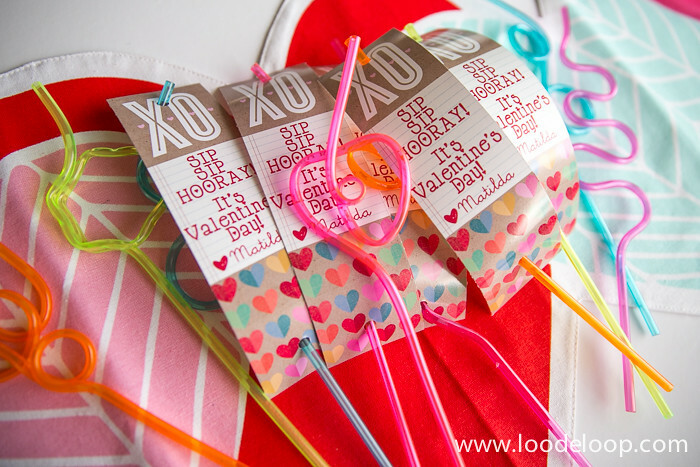 I used these cute Valentine's freebie from Me And My Big Ideas and created a bookmark-sized tag. Print, cut, hole punch, done! And you can have them, too! I created a blank file for you to add your own kiddos name to the tag. These are so fun!! I love any non-candy valentine I can find.